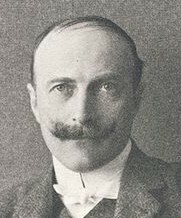 The aristocratic Ernest Florman was Sweden's pioneering filmmaker, who began shooting fiction films of the unusual length of 60 metres in 1897. The son of an army officer who resigned his commission to devote himself to his great passion for photography and both founded a photographic studio and became court photographer to King Oscar II, Ernest Florman was educated in Stockholm and ran his father's branch studio in Göteborg from 1885. He helped his friend and colleague photgrapher C.V. Roikjer establish a film theatre at the 1897 exhibition in Stockholm in honour of the King's Silver Jubilee, and received additional instruction in cinematography from Alexandre Promio, the Lumière operator who filmed King Oscar's arrival at the opening of the exhibition on 15 May 1897, and other local scenes. In July 1897, Florman began to make his own films, produced by Numa Peterson with actualities like A Game of Lawn Tennis and Gate of the Castle in Old Stockholm as well as his first fiction film, Slagsmål i Gamla Stockholm (A Battle in Old Stockholm), shot in seventeenth-century costumes and settings in the re-creation of old Stockholm at the Jubilee exhibtion, where it premiered on 14 August 1897. A second comic farce, An Acrobat Has Bad Luck opened at the exhibition in September. In 1898 Florman became manager for K.E. Ståhlberg's fashionable photographic studio in Helsinki; Ståhlberg was later Finland's pioneering film exhibitor and producer. Florman returned to Stockholm upon the death of his father in 1900, taking over the family photographic business until it closed in 1933, and also becoming the official court photographer.